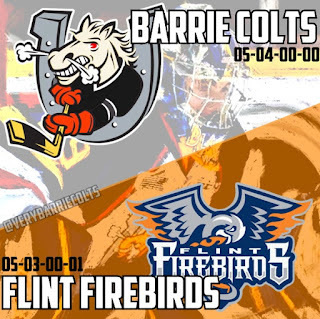 Video Highlights from Barrie Colts 8-5 win over Flint Firebirds. #OHL - Very Barrie Colts | A website covering the Barrie Colts of the OHL. Colts defeated the Flint Firebirds yesterday in the first ever meeting between the two teams since Flint relocated from Plymouth. For a game between two teams that will only meet one more time this was a pretty crazy game. Here are some of the video highlights from last nights game if you missed it or just wish to relive the win. Once again Our friend Darius from DRL - Productions cut this video highlight package from the game. For more of their great videos be sure to check out their YouTube page HERE. Be sure to follow him on Twitter and subscribe to his YouTube page.